The most culture-shocking moment for me was when we were received in Rumira Sondormayo in the cold rain with a welcome dinner which consisted of a plastic laundry basket filled with about 20 types of potato; boiled and whole, accompanied with one hard-boiled egg; warm and still in the shell. As a special treat, we were also offered a dish of salt to add to the food. So there we all were, cold and wet. Eleven of us sat huddled in the darkened interior of a mud brick hut munching on the potatoes and eggs. And honestly, I have to admit, it was one of the greatest tasting and most memorable meals of my life. 2) What inspires you to work for Threads of Peru? As a designer, I’m inspired by the idea that design thinking can be applied to any set of problems to the benefit of the situation – not only that, it MUST be applied. Even if the people involved are not “designers” as a profession. Design is the key to human beings figuring out how to move from a situation that they’re not satisfied with, to one that does satisfy them. Threads of Peru requires that we think about everything from human dynamics, to business management, to marketing and graphic design. The range of issues and the challenges they present – all aimed at the preservation and promotion of indigenous culture in Peru – is what I find so interesting. 3) What’s your favourite Peruvian food? I really enjoy the fresh salsa that often accompanies meals in Peru. I also really love coca tea with mint. Not so much a food, but a drink – coffee. It’s very difficult to find coffee prepared the way I am accustomed to (and addicted to) at home. 5) In your opinion where is the best spot in Cusco for visiting? 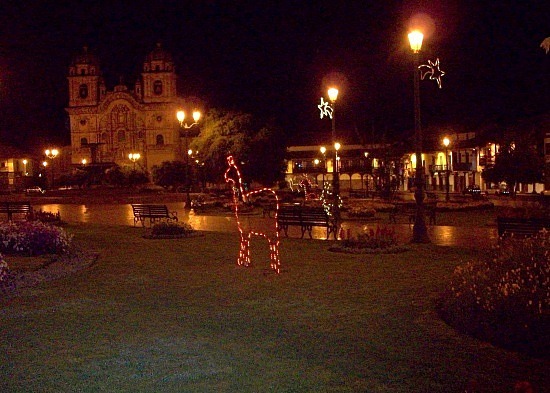 The restaurants and Churches surrounding the Plaza de Armas (Central Square) in Cusco are nice to visit, and I love the square at night; the way the city lights of the residential area are visible on the mountainsides above – like stars. Also the San Blas area, which is within walking distance of the Plaza, is full of interesting shops and local art and crafts. The Plaza at night, lit up with the Christmas decorations! 6) Describe the happiest/most touching moment you have experienced in the communities? For me, it was the first time we went to the communities, which the culmination of a design class project in Canada. Eleven students made the journey, and to finally find ourselves there with the weavers in the mountains for the first time was an experience I’ll never forget. It was snowing heavily for a while, and it was beautiful. 7) Your strangest/funniest moment from living in Peru? 8) Biggest achievement so far? For me, it has been to see the whole structure set up; from weaving workshops and buying in the communities, to the online store and the vast internet information site, shipping and positive customer feedback from all over the world. It has required an incredible amount of work and creative energy to set up all of this infrastructure, and to see the structure finally functioning end-to-end is a great achievement for so few people to have built. 9) Finally, whats the main thing you wish to achieve in the next five years? To be a fully self-sustaining organisation. To see the women’s sewing skills improve so that we can introduce more contemporary product design to our inventory, which will require more complex sewing. Adam is a Graphic and Communication Designer, living and working in Halifax, Canada. Besides working as a professional Designer, he has been a teacher of Design for almost ten years. His interest in bringing Design thinking to bear on socioeconomic issues led to the creation of Project Peru, and to the collaborative development of Threads of Peru. I had been in Peru two weeks when I had the opportunity to visit the communities that I will be working with over the next few months, the highland communities of Chaullacocha and Rumira Sondormayo. The first hurdle was pronouncing the names correctly! I am going to make the trip, which will last three days with one night spent in each community, with Fani our Textiles Project Manager, her husband Saul and Daniel Sonqo our Masterweaver. 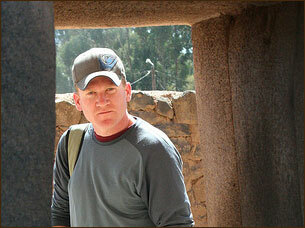 Daniel speaks fluent Quechua so he is also our interpreter for the trip. We set off around 6am for the three hour car journey to Chaullacocha, my fitness level is not exactly up to hiking standards (especially with three experienced hikers to keep up with) so I am hugely relieved when we stop off in Rumira Sondormayo and are told that a bridge has been built connecting Chaullacocha to the road so we can drive all the way there, avoiding a three hour uphill hike. The boys help us take in the food supplies. We are in Rumira to drop off the food supplements for the school which are bought on behalf of another NGO, the women run up to greet us all smiling and eager to shake hands. They are dressed in beautiful bright colours, all wearing a black skirt with a pattern around the bottom, several layers of jumpers, a intricately woven wrap around their shoulders and a red hat with a white band circling their faces to hold it in place. Their legs are bare and they wear sandals, I can’t imagine how they can stand the cold as I am wearing two layers of thermals and still shivering! We drive on to Chaullacocha, the road is made of pressed earth and there is no barrier against the steep drop, as it begins to rain our car drives slower and slower. When we reach Chaullacocha my first impression is that the people here make a stark contrast to their environment. The hills are a dull green with sparse vegetation, apart from that there are several small grey houses and a few earth patches, however when the boys run out from the school to greet us they are all spots of vivid colour, dressed in bright orange ponchos and straw hats with red tassels, the girls are miniature versions of their mothers with their bright skirts and jumpers. After spending around an hour at the school , and eating lunch (my first taste of llama!) we make our way to the first pedido, it has begun to hail so we all gather in the greenhouse, the women and children climbing up the hills nimbly whilst I lumber along afterwards, still unacclimatised to the altitude and terrain. The women sit in the greenhouse with their babies slung over their backs. Daniel and Fani explain what we would like to order and the women all choose what they would like to make, afterwards we head outside and the women work in pairs using wooden poles to measure the right length of thread for the items they will be making. Although it’s my first time seeing this process I can tell that the women are confident in what they are doing and are comfortably chatting amongst themselves as they work. are no street lamps and no kind of electricity around. We head to one of the women’s houses where we are going to spend the night. Inside her house the women and her daughter both wear head lamps to see by, we borrow these to prepare our dinner over the fire. This house does not yet have a chimney so although its freezing outside we have to leave the door open to allow the smoke to leave. Once again I feel very humbled when I think of my own home with central heating, lights and hot water and how easy my life in England is when compared to this. Yet it needs to be said that although it would be a Western reaction to feel pity for the people living in these communities, everyone I have met has been so content and genuinely happy with their lives and work, a lot happier then many people with a lot more money and privileges. The next day, after a very deep and very cold sleep we have the second weaving session outside the school and by midday we say goodbye to the village. We will be back in three weeks for the entrega to pick up the orders. We begin our hike back to Rumira and as suspected I am the weak link in the hiking chain, however with help from Daniel and Fani I manage to trudge to Rumira. The scenery is absolutely stunning and I fall further behind as I am constantly taking photos, however it begins to hail again so we all put our heads down and cover up. Rumira Sondormayo, I am relieved to learn, has electricity. Once again one of the women has offered to prepare us dinner, there is always a very communal feeling around meal times, everyone cooks for each other and shares what food they have. I spot some guinea pigs under the bed and realise that they are destined to be eaten in the future as the Peruvian delicacy ‘cuy’. Apart from this the main staple of every meal has been potatoes as they are one of the few things that grow well at this altitude. I quickly learned that if I brought out any food from my backpack it was expected that it would be shared amongst everyone! The next day we hold the final pedido with all the women from the village, again I see that communal ethic as the women work together to sweep up the clearing we are going to use and then carry out the dirt in pairs using pink wrappers. The weaving cooperative of Rumira gathers in the clearing. The thread measurement is able to get well underway this time as the weather is dry and sunny, the women are all happily talking in Quechua as they work, sometimes a husband will come and sit next to his wife. I have read a lot about macho attitudes prevailing in Peru, especially in the communities but if anything the husbands here seem to be in awe of their wives and watch quietly as they work. After an hour or so I take a walk around the village and meet some more of the children, they have free run of the village whilst their parents are working and are making the most of it, running up and down the hillside, shouting to each other and all playing games together, the elder children taking care of the younger. They are obviously having such a good time I wish I was a kid again so I could join in. When it is time to leave I feel relief that I will be able to shower again but also a kind of envy. These people all belong to their community and all belong to each other, they all know each other by name and all look after each other. That kind of altruistic community environment is practically extinct in my culture and I can now understand why it’s so important to help maintain it.